I remember reading an interview with former Metallica-member Dave Mustaine just before his band, Megadeth, released their new Cryptic Writings, during which he said something to the effect that he had heard Metallica's Load take a lot of critical punishment from fans and how he thought that was a shame, but he'd heard a new, harder album was on it's way. The album to which he referred was ReLoad. Fans remained skeptical. After all, rumour had it that the album was really just cutting floor material from the Load recordings. 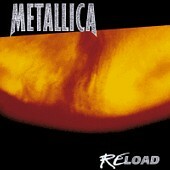 In my humble opinion, ReLoad is far better than Load, but remains a weak effort by comparison to past Metallica releases. Load features far more "filler" material, something Metallica fans of the 80s thought they would NEVER see, and overall simply offers more consistently good songs. The first song from the album, from which Metallica's weakest video was made, is "Fuel." Fortunately, the song is better than the video, and pretty much the only song on the album which presents the speed and thrash style fans found on Metallica's first album, Kill 'Em All. Lyrically, the song seems very rushed and soulless, though it is rumoured to be about drug addiction, which makes "Give me fuel, Give me fire, Give me that which I desire" a little more significant. The second song, and the first single from the album, is "The Memory Remains," a delicious 4 1/2 minute rock song with a great heavy main riff . The lyrics are intriguing if difficult at times to understand, but Metallica fans should be used to that by now. I hear a lot of people complain that Metallica songs are too short as of recent releases but this song, as many others, is very well paced. "Devil's Dance" is the third song and not much to speak of. This is on of the unfortunate filler songs that could just as easily been left in the studio, as are "Bad Seed," "Prince Charming," and "Attitude." "The Unforgiven II" has been given a lot of grief as simply a ripoff of "The Unforgiven," but it remains a fantastic song nonetheless, and exemplified the tremendous progress Hetfield has made in improving his singing voice. The lyrics are totally independent of the first Unforgiven, and seems to be about James Hetfield's life with a woman who's lived the same sort of life as Hetfield described in "The Unforgiven." The song has almost cloned riffs during the verses and chorus, although I believe they are in a different key. I'd be very intrigued to see Metallica perform a live medley of the two songs, juxtaposing the subject material and music. "Better Than You" has a nice hard riff but gets old quickly. "Slither" has some cool lyrics and a riff that seems almost a direct clone of "Enter Sandman" from The Black Album. "Carpe Diem Baby" competes with "Fixxxer" for best song of the album - both songs sport fantastic lyrics, but I think I like the riffs on "Fixxxer" better, and it's nice to see a Metallica-style epic come back. Fantastic song, "Fixxxer." "Where The Wild Things Are" is a cool song when it's rolling, but takes to long in between... the end of the chorus is the only time the song seems to actually *be* there. "Low Man's Lyric," much like "Mama Said," is a very quiet song for Metallican standards. Personally, I like it a lot. The lyrics are down and insightful, if only by Metallica standards... it reads like a suicide note. Some interesting synth work is shown on this song, but if the "Herman Melville mix" of "Until It Sleeps" (found on one of the "Unforgiven II" import singles) is any indication, I sincerely hope that the band stay as far away as possible from any more experiments in techno. So overall the album sports about six great songs, which is about the same as most of Metallica's albums. The trouble is, unlike most of their albums, there are a lot of really tiresome songs mixed in there as well. I wish the band had stuck to their "8-song-album" pattern of the 80s, but it's still nice to hear their new material. Overall, I think old Metallica fans will actually enjoy parts of this album once they get over their proud indignation at the idea of a slow tempo, but not more than they enjoyed Master Of Puppets and Ride The Lightning. PS - Stop making videos, Metallica! "Fuel" was horrible!